Ok, so the first try, described below, wasn’t really working out for me. The original files are updated too often during updates, meaning the link changes back all the time. So, instead I use the CSS to override the original information. Change the site CSS by going to the admin site, choose Appearance, choose Edit CSS. the div holding the “Proudly powered by WordPress”-link and the “Theme: Twenty Twelve”-text uses the CSS-class “blog-credits”. There are several approaches one might use to alter the appearance. I will use the quick and not so very sophisticated option of just removing the content. Since there is no information I need to replace the existing with, I’ll just use the display:none; CSS rule to remove it. So, add the following code to the CSS Stylesheet Editor content and the information should stay hidden even after updates to the core files. In the original plain Twenty Twelve theme for WordPress (currently in use on this site) there is an infinite scroll feature. This feature introduces a footer once it kicks in. That footer links back to WordPress. To change this footer credits information I did the following. Step 1, go to the WordPress dashboard. Step 3, Choose the correct plugin to edit. 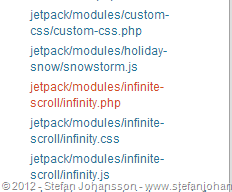 The infinite scroll feature is in the Jetpack plugin. Step 5, change the credits lines to your liking. The definition of $credits is in the infinite blog footer function towards the end of the file. This entry was posted in General and tagged Hack, How To, Themes, WordPress on 2012-12-23, Sunday by Stefan Johansson. Where should I put this code ? the CSS styles can be added directly to the global custom CSS file/CSS Stylesheet Editor that is available through the WordPress admin pages/dashboard. Navigate to yourblogaddress.com/wp-admin and choose appearance -> Edit CSS. In this page, just paste the CSS style information you wish to use and hit Save Stylesheet. Another note about custom CSS. This is only available on self-hosted installations or upgraded wordpress.com sites. A standard free wordpress.com site can not use custom CSS. You will need a package such as the “Custom Design” upgrade for this to work. when iam using jetpack infinity scroll, after 7 posts it is scrolling ( at the time of scrolling it is creating a new page) when we check that page with broken link checker tools it is creating a broken link. Hi, which link is broken? The footer link? i just want a single post to come in a page, i do not want infinite scroll, i want a single post and list of old post. is this possible in this theme. You can control the front page settings under Settings, Reading. You can either set up the front page to not use infinite scroll and show just one post (the latest) or you can set up a static page and use as a front page. for your list of older posts you can use a widget or a plugin. The flexibility and configuration settings of the Twenty Twelve theme is limited. you could try to search for child themes if you have other requirements. there are several available that build on the Twenty Twelve but add features and functionality. Thank you! I fought with this for hours trying to ged rid of the footer crap. You are a lifesaver.